Awamori is an earthy-flavored alcoholic beverage made only in Okinawa, Japan. It is similar to sake but has several major differences. Instead of being brewed like sake, it is distilled like a single malt scotch. After a single distillation it is diluted with water. It also has higher alcohol content than sake since it is usually sold as 50 to 60 proof. But it can also be found at 120 proof. Awamori is made from Thai-style long grain Indica rice versus the long grain Japonica rice used in sake production. This rice is still imported from Thailand. The process of distillation was imported from Thailand to Japan. That could be the reason that rice is still imported from Thailand today. Black koji mold, which is indigenous to Okinawa, is used in the fermentation process of Awamori. White koji mold is used in the production of shochu. There are several theories on how awamori gets its name. “Awa” means foam and “mori” means to rise up. One idea is that the amount of foam is proportional to the alcohol content. Others believe that it merely refers to a large amount of foam generated in the fermentation process. Awamori was brought to Okinawa in the 14th to 15th century. A member of the Satsuma clan named it to distinguish it from other types of shochu. The emperor allowed only 30 families to distill it. This privilege was inherited so it stayed in the same family for many generations. Today there are 47 distillers of awamori. Crushed long grain Indica rice imported from Thailand is washed until the outer covering is removed. It is then soaked in water, drained and steamed for an hour. Then it is cooled to 40 degrees Celsius. Black koji mold is added and left overnight in the steamer. The rice mixture is then spread over shelves for two days to allow the mold to breed which coverts the starch to sugar. Black mold water is added and this mixture is allowed to ferment for two weeks. 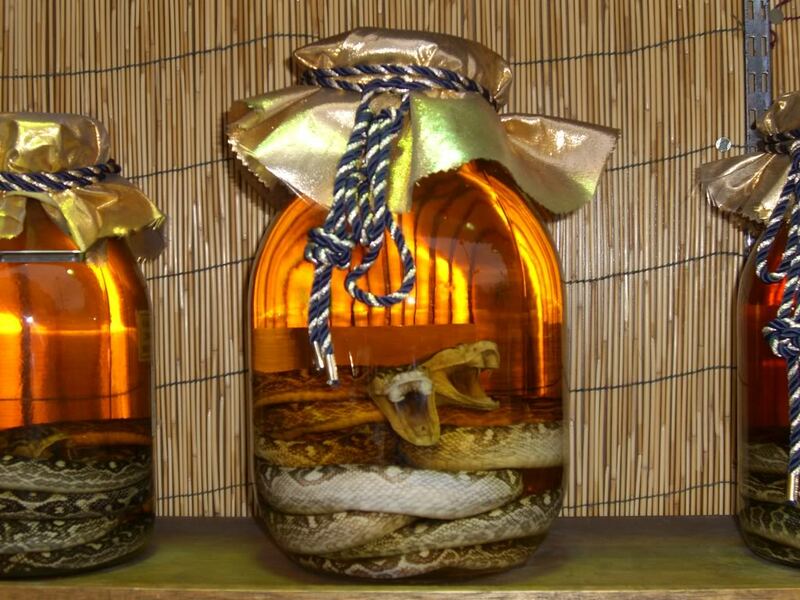 It is then moved to a distiller container for two and a half hours at which point it becomes awamori. Okinawa is a sub-tropical environment. This means that a brewed product would have to be chilled and would not last long. Since awamori is distilled and contains a lot of citric acid, it can withstand the long fermentation and aging processes. Awamori is called “kusu” after aging 3 or more years. Actually, only 51 per cent of the awamori liquor has to be aged to be considered to be kusu. Therefore, it is important to check the label to make sure it is “100 per cent aged.” Its flavor mellows after 10 to 25 years. Pour awamori over ice in a “rock glass” tumbler. Add a splash of water and a squeeze of fresh lime. Shake three or four times. Because inhabitants of Okinawa have the longest lifespan in the world, people are interested in their secrets. One of these secrets is the natural health supplement known as Awamori Moromi Black Vinegar. Until recently, it has been a well-kept secret from everyone except those who distill awamori. Now, it is widely used in Japan to promote health and longevity. Awamori black vinegar is actually light in color. It is a tonic made from the fermented rice mash that is a by product of awamori. Originally, it was fed to the pigs. Then farmers noticed how healthy the pigs were after eating the mash. They were exceptionally healthy, thrived, had healthy appetites and were almost fat-free. Therefore, they started drinking the tonic themselves. These amino acids are very important nutritional supplements for healthy growth.